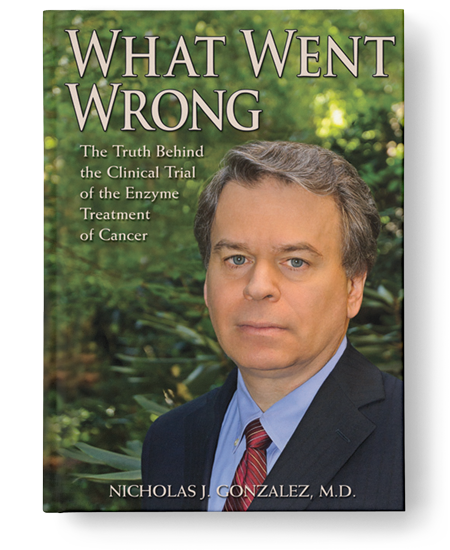 In What Went Wrong, Dr. Gonzalez chronicles the failure of the National Cancer Institute-NIH funded clinical trial conducted under the auspices of Columbia University, set up to test his nutritional treatment in patients diagnosed with pancreatic cancer. In this first-hand account, Dr. Gonzalez reveals how poor trial design and poor implementation at the highest levels of the academic research world helped undermine this promising project. The book discusses in detail two official government investigations that have confirmed Dr. Gonzalez’s allegations that the study was not properly supervised. Dr. Gonzalez also illustrates the biases within the scientific community that make fair testing of unconventional treatments so difficult. The Introduction, the Table of Contents, and Reviews can be viewed on the New Spring Press site. “This extraordinary story paints a detailed picture of mismanagement of a promising clinical trial of pancreatic cancer therapy by vested interests of the National Cancer Institute, the National Institutes of Health, and Academia. The story is one of conviction, persistence and dedication in the face of opposition by the cancer industry.” Kilmer McCully, M.D., author of The Heart Revolution.